Hump Day: That “crazy old cat lady” has done it now and it’ll be a dog’s life! Well, for all of you who’ve been concerned that I’m a crazy cat lady disguised as a (rich, gorgeous, virile) guy in his (very) extremely late 20s, you’ll be pleased to know that I’ll soon be making a change in a positive direction. The cats will still be with me. They’re not going anywhere. Besides, being cats, they’ve somehow managed to get their names on the deed to my house. Those furry little buggers can be uncannily sneaky. The good news is that, in early May, I’m going to pick up my new dog, a four-year-old Coton de Tuléar, a small white ball of fur with the very pompous-sounding purebred name of Polana Milane Passioncoton (“Milane” for short). I was looking to rescue a Coton a few years ago and even went to visit one at the same breeder from where Milane is coming, but the timing wasn’t right. The cuteness of this little girl cannot be exaggerated. She’s to die for. Well, that may be a bad choice of words, because I’m pretty sure that my cat Cindy will want to kill her when they meet. Cindy is the boss of the animal kingdom in the household – an animal kingdom that currently is made up of two cats, the other being the big, floppy and lovable Casey. He’s twice Cindy’s size and is pretty much her slave. It will be interesting to introduce a dog to the household. A few years ago, introducing a third cat proved to be a complete and utter disaster. I adopted Charlotte, a beautiful Siamese lynx point mix, and had great hopes that she would blend right in with the other two. We would be one big happy family, so happy that I would get a personally signed Christmas card from God himself every holiday season. Unfortunately, Charlotte’s stay was about as peaceful as an atom bomb being dropped into an erupting volcano. We all talk about “cat fights” between people as if they’re something terrible. Cat fights between real cats are beyond scary to watch. That’s what I had to deal with for seven months before I made the painful decision to re-home Charlotte for her own safety – and my sanity. It was a huge relief for everyone. The thing about cats is that they’re very territorial. Ironically, cats and dogs – despite the cliché – sometimes get along better than cats and cats because they don’t see each other as competition for territory, mates and food. And then there was Daisy the cockatiel. Again, I’m not sure what the heck I was thinking when I got a bird when I already had two cats. It would be like hiring a mouse to babysit your favourite block of cheddar cheese. Sure, there was peace in the valley while I was in the room and my eyes were on them, but the minute I left the room Casey would charge poor Daisy’s cage and try to get at her to eat her like an after-dinner mint. You’ve heard of jelly donuts? The cage was the donut. Daisy was the feathery jelly. And Casey wanted that donut filling no matter what! The cage would rattle. Daisy would scream. Casey would be trying to get through the bars. Thank goodness I never let him watch Tweety and Sylvester cartoons. At some point, I would be yanking Daisy out of his mouth, I’m sure. I hope the third time is the charm with little Milane. The cats won’t find her delicious (I hope) and the territorial issues shouldn’t be too bad. They’ve only met one dog – my friend Bob’s dog Riley, a sweet dog who loves cats. Casey got used to Riley in about an hour and was ready to be lifelong pals. Meanwhile, Cindy was still slinking around with her back up in the air and hissing. Let’s just say that she was more than a little bit out of sorts. When Milane arrives, she’ll have everything a dog could love: toys, good food, a nice bed – and a built-in set of siblings, one who’ll love her from the get-go, and the other who will plot to kill her in her sleep à la Stewie vs. Lois on Family Guy. There will definitely be an adjustment period for everyone. Me, especially! While I’m excited to be finally getting a dog, I’m also more than a little nervous as to how the other two fur balls will take to her. I don’t want to wake up one morning to find the cats’ claws full of mud and a fresh grave dug in the garden with a little white tail sticking out. I’m looking forward to taking Milane for walks and bringing her to visit friends and family. She’s hypoallergenic and apparently great with children, so finding a babysitter shouldn’t be too difficult from time to time. And I’ve already told my Facebook friends that if I ever put ribbons in her hair to make it look like she has pigtails, then do me a favour and shoot me. Just tell the RCMP it was justifiable homicide. You know what those crazy dog people are like! One Response to Hump Day: That “crazy old cat lady” has done it now and it’ll be a dog’s life! I knew you would write a column about doggyhood, but didn’t think it would be so soon, ha! For sure, you’ll have to keep a close eye on your two felines as they may not be too happy to have another “fur ball” in the house, although this one is actually a cotton ball! I can just picture Princess Milane running for cover in your office…let the fun begin! 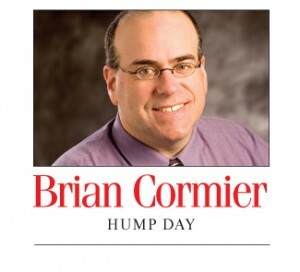 Subscribe to Brian Cormier's Weekly Update!